Congratulations to "Jo-Anne", the winner in Rachel's giveaway. Thank you to all who participated! Imagine being a young girl and witnessing the brutal shooting of your mother and father in cold blood. Whisked away into Witness Protection and your life forever changed. Sadie Lane, the heroine in Out of Hiding experienced an awful trauma. One that has impacted her entire life. She knew even as a young girl that she would seek revenge against the man who killed her parents. Sadie refuses to be a victim and becomes a highly skilled private investigator. She bides her time, waiting for the perfect moment to make a move against Igor Vladimir. He took everything from her, and now she wants revenge. Sadie goes on a quest for revenge to quench the need to do something about her deep wounds. But along the way realizes that the desire for revenge is consuming her. It drives her to be someone she doesn’t like. Someone who she doesn’t really want to be. She has to make a conscious choice to fight those feelings for revenge and search for justice instead. We’ve all faced hardships and trauma in life—even if not as horrific as what Sadie faced. But where do we draw the line between wanting justice and seeking revenge? It’s a lot easier in the abstract to favor justice over revenge. But once you’re in the situation, like facing a traumatic loss, emotions run high. 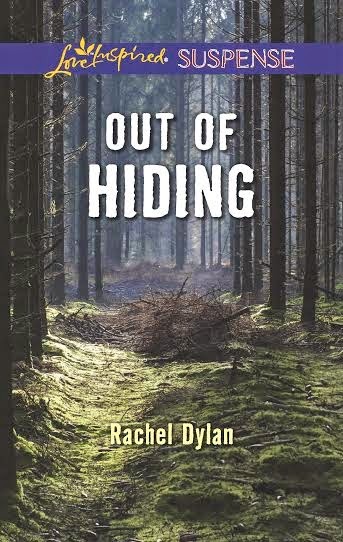 If you want to jump into the internal struggle Sadie faces between revenge and justice, I hope you’ll grab a copy of Out of Hiding. One ebook copy of OUT OF HIDING to a commenter. Rachel Dylan writes inspirational romantic suspense. Being a Georgia girl, she thrives on sunshine and warm summer days. She loves animals and is active in animal rescue. Rachel enjoys adding loveable pets to her stories. She lives in Atlanta with her husband and five furkids--two dogs and three cats. Rachel loves to connect with readers. You can find Rachel at www.racheldylan.com. Giveaway ends 11:59pm EST Aug. 5th. Please supply your email in the post. You may use spaces or full text for security. (ex. jsmith at gmail dot com) If you do not wish to supply your email, or have trouble posting, please email maureen@justromanticsuspense.com with a subject title of JRS GIVEAWAY to be entered in the current giveaway. P.I. Sadie Lane sounds like an intriguing woman with such a troubled past that just from the blurb, I am drawn to her and want to know more. I love stories with people who are in the Witness Protection program, so that aspect was very interesting to me. I am adding this to my TBR list. Thank you, Jo-Anne. Sadie is definitely a strong woman who has secrets! Sadie sounds like she has a great story to share... the pain, fear and anger she has had to deal with... I do not know how I would handle it... thanks for sharing! Thank you! I love creating strong female characters. Seeking revenge can be crossing the line of no return. Can't wait to see what happens. Yes, and Sadie faces quite a struggle with it.